I was startled to see this beautiful Great horned Owl flying into a nearby tree while out with my camera. I hid behind some trees and watched, and luckily for me, s/he flew again, this time right across a field near where I stood. S/he had a determined look, and was probably out hunting for a late breakfast snack. 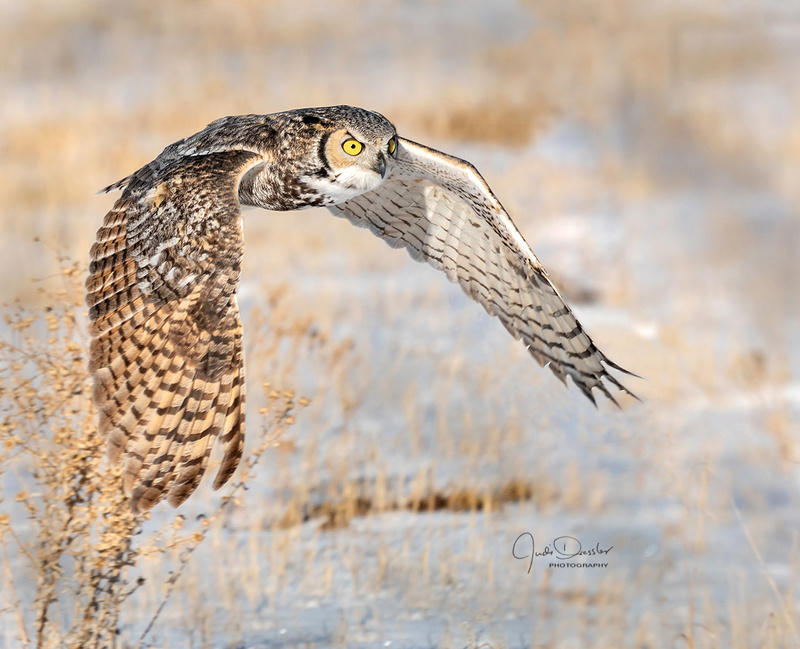 Great horned Owls (sometimes known by nicknames such as “tiger owl”) are large owls native to the Americas, where their deep hoots may be heard across distances, especially in the winter when they begin thinking about nesting. This owl is an extremely adaptable bird with a vast range and is the most widely distributed true owl in the Americas. Great horned Owls typically nest in large trees but will also nest along bridges and other buildings, or even on the ground. They usually adopt a nest that was built by another species, but they also use cavities in live trees, dead snags, deserted buildings, cliff ledges, and human-made platforms. Pairs may roost together near the future nest site for several months before laying eggs. Aggressive and powerful in their hunting, they will take prey as varied as rabbits, hawks, snakes, and even skunks, and will even attack porcupines, often with fatal results for both prey and predator.